President Mohammed Morsi’s supporters and opponents have staged rival rallies across Egypt but there has been violence in the north. Tension has risen ahead of a Sunday protest planned by the opposition. 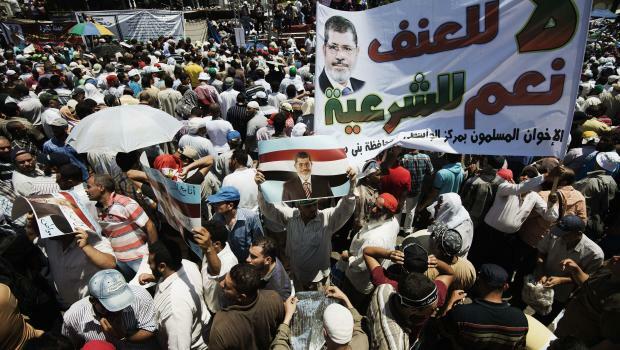 Thousands of Mohamed Morsi supporters rallied outside the main mosque in Cairo’s Nasr district. At least one person, said by state TV to be a US journalist, was killed in Alexandria as protesters stormed a local Muslim Brotherhood office. The US embassy said it was trying to confirm the reports. Dozens more were injured when anti-Morsi protesters and Islamists clashed in the northern city, the second biggest in Egypt. The office of the Muslim Brotherhood, which backs Mohamed Morsi, was set ablaze and birdshot was fired. The authorities are reported to have called in riot police and army helicopters to try to quell the violence. A Muslim Brotherhood-funded TV channel said petrol bombs were thrown in another northern area, Sharqia. At least five people are now reported to have died in northern Egypt in violence linked to the political situation in the past few days. Egypt’s leading Muslim authority, the Al-Azhar institute, has issued a statement warning against escalating violence. “We must be alert lest we slide into a civil war that does not differentiate between supporters and opponents,” it said. Mohamed Morsi’s supporters are holding “open-ended” rallies before what the opposition bills as big protests on Sunday calling for him to resign. Sunday is the first anniversary of the president’s inauguration. Thousands of supporters of the Muslim Brotherhood and its Islamist allies massed outside Nasr City’s Rabaa al-Adawiya mosque on Friday. They stressed what they see as Mohamed Morsi’s “legitimacy”, rejecting the opposition’s demand for him to resign. Mohamed Morsi opponents gathered in Tahrir Square, ahead of Sunday’s planned march to the presidential palace, and anti-Morsi protesters began a sit-in outside the building. Police officers and former military personnel also assembled outside the ministry of defense in Cairo in opposition to Mohamed Morsi’s rule and called for the military to take power again. The main opposition coalition on Thursday rejected President Mohamed Morsi’s offer of dialogue. In a statement, the National Salvation Front said it “remained determined to call for an early presidential election”. “We are confident the Egyptian people will come out in their millions to hold peaceful demonstrations on all of Egypt’s squares and streets to realize their aspirations and to put the 25 January revolution back on track,” it added. The president said divisions threatened to “paralyze” Egypt, in a speech on Wednesday to mark a year in office. Mohamed Morsi also used his televised address to warn the media not to abuse free speech. Within hours ripples from the speech could be felt across Egyptian media. A talk show on the al-Fareen TV channel ended abruptly on Thursday night when the presenter learned he was to be arrested. Host and owner Tawfiq Okasha is accused of spreading false information, and the channel has ceased broadcasting. Another prominent presenter resigned on air on state-run television in protest at what he called government interference in the editorial content of his programme. In his speech, Mohamed Morsi defended his performance, admitting errors and promising immediate and radical reforms to address them. “I was right in some cases, and wrong in other cases,” the president said. Mohamed Morsi apologized for the fuel shortages that have caused long lines at petrol stations and angered many Egyptians, and also for failing to involve the nation’s youth enough. But despite his initial conciliatory tone, the speech swiftly moved into a condemnation of those he blamed for Egypt’s problems. “I took responsibility for a country mired in corruption and was faced with a war to make me fail,” he said, naming several officials he believed wanted to “turn the clock back” to the Mubarak era, including politicians, judges and journalists. “Political polarization and conflict has reached a stage that threatens our nascent democratic experience and threatens to put the whole nation in a state of paralysis and chaos,” Mohamed Morsi warned. Mohamed Morsi called on opposition figures to “enter elections if you want to change the government” and criticized them for refusing to take part in a national dialogue. The head of the army earlier warned it would not allow Egypt to slip into “uncontrollable conflict”.